Singer and actress Heather Headley portrays social worker Dr. Clarice Jamison in the series “She’s Gotta Have It.” Screenshot from Netflix. 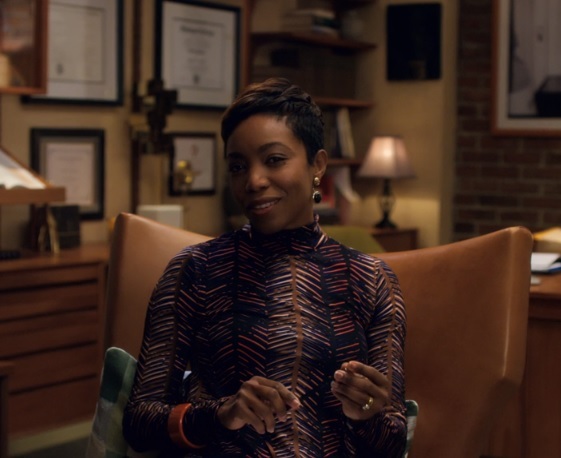 Singer, songwriter and actress Heather Headley plays social worker Dr. Clarice Jamison in “She’s Gotta Have It,” a Netflix series that reboots director Spike Lee’s groundbreaking 1986 film. Like the original movie the series follows Nola Darling (DeWanda Wise), a fiercely independent, struggling Brooklyn artist who is juggling relationships with three men and a woman. The series touches on many themes, including how women view their bodies, sexuality and sexual harassment, racism, homophobia and gentrification in Brooklyn’s once predominately black Fort Greene community. Lee, who wrote the script with his sister Joi Lee and playwright Lynn Nottage, also infuses the series with images from Brooklyn’s past and present and music ranging from Sade to Meshell Ndegeocello to Frank Sinatra. Nola is traumatized when a man who harasses her on a dark street physically assaults her. She first visits Dr. Jamison at the suggestion of a friend in Episode Three of the series, #LBD Little Black Dress. Nola Darling in a therapy session with Dr. Jamison. Screenshot from Netflix. The camera focuses straight on Dr. Jamison as she introduces herself. The camera cuts to her office wall to show her bachelor’s degree from Spelman College and her doctorate from the Columbia University School of Social Work. Take time to watch the series and follow Nola and how she interacts with Dr. Jamison. Social workers help people overcome life’s challenges so they can live up to their full potential. To learn more visit the National Association of Social Workers’ “Help Starts Here” website.